This is a guest blog post by photographer Brian Palmer. 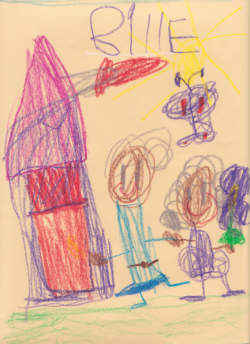 Drawing of Brian's daughter with Belle, Skip Cohen's daughter. While this may sound biased, my daughter Sara is very skilled at drawing. She’s actually more advanced than many kids her age. While she does indulge her imagination fully, the difference between her classmates and her is the amount of drawing she does daily. Practice. Sara draws easily 10-20 pictures a day. Between playing, seeing her shows, and chasing our dog, she always makes time to draw. Like Sara, we as creatives can excel at our crafts too, but we also need to make time to learn, grow and develop. Unfortunately, too often life gets in the way…or so we are led to believe that. Whether you are a full-time pro, part time weekend warrior, or semi-pro hobbyist, time never seems to be on our side to practice new techniques and shooting styles. We have all used the phrase: “I just don’t have enough time in the day to practice/learn [fill in whatever you have been putting off]”. The truth is, we get so caught up in daily routines that cutting away a little time to practice our craft seems impossible. But there is time, plenty of it. But most of us, like Sara’s friends, cannot see the forest from the trees. First things first. Organize your gear; keep it clean and ready to use. It is much easier to break you gear out quickly if everything is in order and charged. Trying to clean lenses from a shoot days back, download or format cards, switch to the proper lenses, and reset special settings takes away from shooting time. We should be in the habit of putting out gear away in a ready to use fashion, meaning we can pick the camera up and start shooting. The next is suggestion is pretty obvious; keep your equipment handy. Not necessary on your shoulder all day, but easily accessible. Keep an extra camera body in your car for when you are out and about. Generally as I upgrade gear, I try to keep an extra backup body as a quick go-to camera with one all around fast lens. Keep your setup simple or just the gear you plan on practicing with so avoid unnecessary decisions on what to shoot with. Now that your gear is ready and easily accessible, you just need time to actually shoot. If you have a pet that you have to take out in the morning to do its business, you just found your first daily 10-15 minutes. You just need to find one aspect of shooting that you want to concentrate on and focus on it. Or make a project out of it, photographing the sky or sunrise in the mornings. Taking special note on how the clouds look as the sun rises because that would come in handy when capturing your client during a sunset. While the 10 minutes from walking pets will help gain experience, there are a few hours in the day that we can all take advantage of. For part-times with a day job there it is the lunch hour. Take your gear to the job and try to shoot 2 times a week over lunch to capture a subject around the job. Try a new technique or style; shoot the same thing for a week from different angles each time. One of the differences between being good and great is the amount of practice and hard work that is put into a craft. If there isn’t enough time in the day, try unplugging from TV, PC, Facebook, Twitter, etc. Setup specific times to indulge in these activities and stick to the time you allocate, when the time is up, put your gear down. Include your family in the shooting to help you practice more techniques, such as posing and being in the clients shoes. Keep your gear clean and readily available so there is no wasted time getting everything together. Practice allows you to make painful mistakes that are NOT at your client’s expense. Brian Palmer is a photographer based in Uniontown Ohio specializing in Wedding and Portraits, published in GoingPro, Photo District News and on various blogs within the photographic industry. Check out his blog for more inspirational work and thoughts.